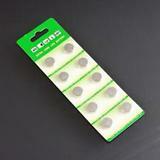 Use with your ClearNeon UV Reactive paints to make the blacklight effect vanish instantly. Create deep blacks in your designs, cover up your mistakes, or to start over with a clean canvas. ClearNeon Black Eraser makes the ClearNeon blacklight effect vanish right before your eyes. Dries instantly. When sprayed over ClearNeon paint, it prevents paint from fluorescing under blacklight. Cover your mistakes or simply change it up. Also use it to create deep black on lighter canvas or surfaces: when applied to white or fluorescent surfaces (ie: a white t-shirt), it will make those areas appear black rather than glow under blacklight. This clear coat goes on smooth and is virtually undetectable in normal light. Must hold Black Eraser within 4 inches of target for best effect. Note: The UV ClearNeon paints usually work fine on white walls without needing Black Eraser. ClearNeon, when used with the right blacklight will illuminate brighter than the white walls. Black Eraser is unbeatable when you want deep, pure blacks though. Each aerosol can is 7.3 oz. IMPORTANT SHIPPING INFO: Laws require that spray paint can ONLY ship via Ground transportation. 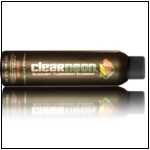 ClearNeon Aerosol cans CANNOT be shipped via air, including ALL international destinations. Note: the Brush-on version does NOT have any shipping restrictions. Ordering this item means you agree to these shipping conditions.